I am really excited to be writing this review because not only is this product absolutely amazing, it’s one of the very first high end beauty products I purchased. Way way back when I worked in the ruthless world of retail, I remember on my very first day at work, I stood behind a YSL rep in the staff lift. Just the two of us. Here’s my opportunity I thought, we have 8 floors before we would depart ways, which meant, providing no one else stopped the lift, I’d have approximately 60 seconds to find out anything I wanted. uninterrupted; without the glaring lights of the shop floor, the nosy onlookers wanting to see what you’re after and the impatient shoppers waiting for their turn. I wasted a good 15 seconds thinking should I? Could I? and then I just went for it; “Excuse me? Hi. I work for ********, it’s actually my first day. I’ve heard soo much about YSL mascara, well YSL in general, great brand, so um..which mascara do you think you would recommend?”. 10 seconds left, why did I waste so much time rambling? great brand?! She’s not Yves, wtf? !Pretty YSL lady looked bemused. In hindsight, I’m pretty sure she was wondering whether I was “special” or quite simply just weird. Ping! The doors opened. Great, time’s up, I thought and just as I felt the tide of embarrassment and regret build up in the pit of my stomach, YSL lady said ever so glamourously as she stepped out on to the shop floor “Lash Faux Cils 1”. And with that, she vanished. Well…the lift doors closed. Admittedly, at the time I thought I heard ‘lash 4 6 1″ *insert embarassed face here*. Cut to a few days later when I did finally figured out what she meant, I purchased my very first Yves Saint Laurent Mascara Volume Effet Faux Cils. How exciting! The all gold packaging with simple embossed logo on the tube looks very chic and sleek. The tube is also pretty slim so it can easily slot into your bag. The bristles are designed to pick up all* the eyelashes without clumping. Additionally, I have to add that it smells amazing! 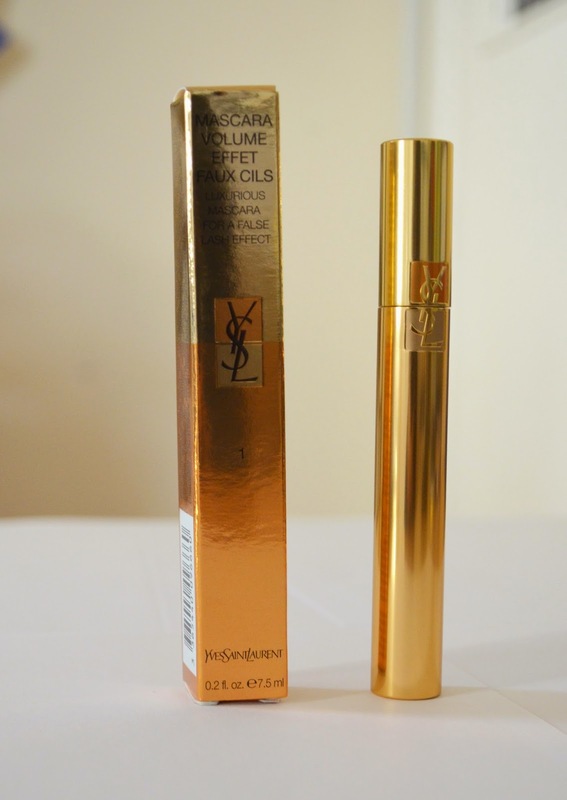 I absolutely hate the smell of mascara, its got a weird heavy/musty smell, YSL however smells fruity and light! One of the main reasons I love this mascara is because not only does it volumise and lengthen, it performs miracles! 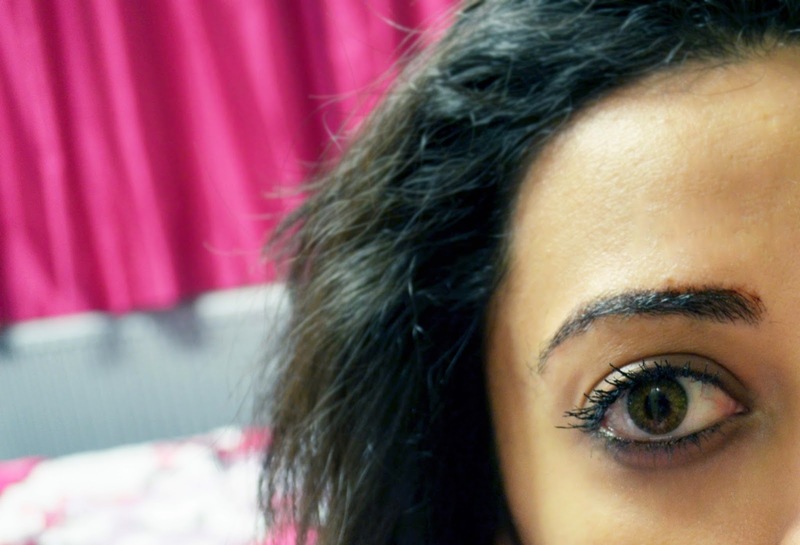 My eyelashes are extremely straight, they do not curl..at all. Even with an eyelash curler, after about 5 minutes, if I’m lucky, they will go back to being straight. With Faux Cils however, they curl upwards without me having the use an eyelash curler! 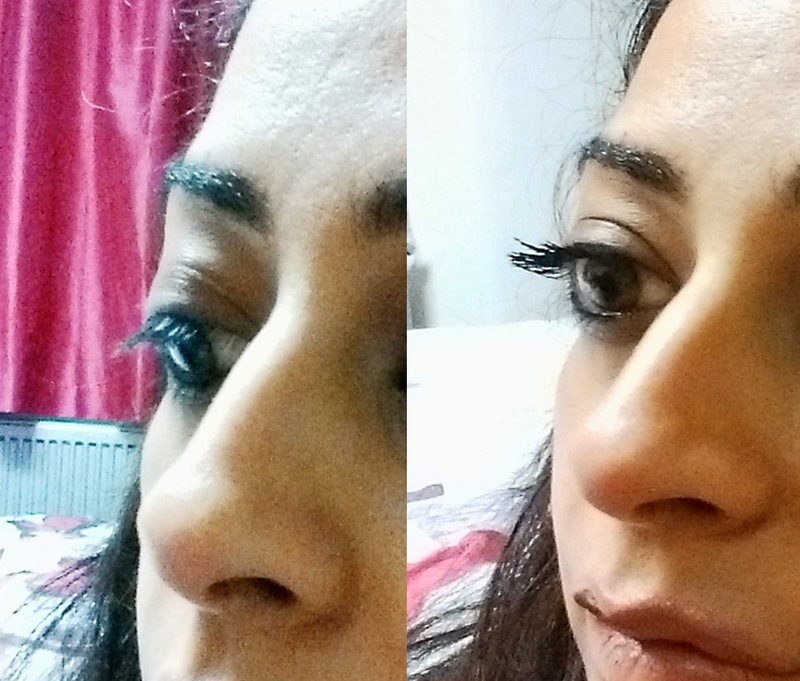 Here are the results without using an eyelash curler. I forgot to take photos with my SLR before I put the mascara on, doh! But here are some low quality before and after pics. The only down side to this mascara and I mean ONLY downside is that it retails at £23.50. The price is actually what put me off buying it for a while, but a recent re-purchase has made me realise that this product is definitely worth every penny. Have you tried this product? Your thoughts?